I have always liked the romantic thought of just showing up at the airport and taking a seat on the first flight out. But every time we start thinking about a vacation much more planning is done. I may be getting less adventurous as I age or my list-making hubby may have finally rubbed off making me more of a travel planning geek. I will start with a mea culpa and admit we create detailed OneNote electronic notebooks to capture all the trip plan details. Both David and I add sections and pages as we work through the details (arguing mostly about our very different ideas of how to organize stuff). This notebook comes in handy as a reference on my iPad when I need reservation or flight numbers, hotel booking preferences and to-do lists. I had been using Evernote since it was fully supported on the iPad but I went back to OneNote with the iPad release. The OneNote notebook brings everything together in one place and lets me capture all the details of the trip as we go, to help with tweeting and blog updates. The February 2015 addition of handwriting was a great update for quickly adding notes and comments as we travel. A good start for a travel planning geek. Hotels.com is our default hotel booking site. We have earned enough free nights to get us Gold status and unlike many other loyalty programs (can you say Aeroplan? ), it has been easy to redeem free nights (you get 1 free night for every 10 you book for participating hotels). Keeps us booking through there! We have also had great service when we have had to change hotel bookings. The only down side to not booking directly with the hotel is the tendency of front desk staff to try to pawn off the absolute worst rooms on us because we didn’t book directly. But David has stiffened his Canadian backbone and regularly declines these rejects! I had to delete the whole original section of this blog that I wrote about my Canadian airline of choice. As a captive market for most of our domestic travel, we have little choice for most flights (AirCanada or WestJet). I thought I had found a winner but when customer service recovery mattered most, they dropped the ball (send me a comment if you want the details). For our international travel needs, we shop based on destination and how we want to travel, with input from other travellers on the route we are going. We recently found out that as retired military, David got great baggage allowances on Air Canada. This has certainly become a factor when we are travelling extra heavy in baggage – e.g. with extra scuba gear or when we need more clothes to cover a long cruise. We pay dearly for not being able to collect points on only one airline, but the pain of suffering bad service still keeps us hopping around. Maybe we may finally accept that they are all as bad as each other! A key part of our travel planning is done though TripAdvisor reviews. David is an inveterate Top Contributor (http://www.tripadvisor.com/members/dive_ability), complimentary when we have great experiences and detailed when he has constructive feedback. We make judicious use of TripAdvisor for our travel and aim to be helpful to other followers. Now that I am tweeting (LDH @TravelAtWill) we have another venue to share our travels and travel planning geek experiences. We are not one kind of travel planning geek. We travel with competing technology platforms – Apple versus Windows/Android: laptops (MacPro and Windows machine) and phones (iPhone 5s and Samsung Galaxy S4). There are two cameras (Canon DSLR and Canon G11 in an underwater housing), two eReaders (Sony and Kobo) and cases of electronic accessories. My absolute device of choice for travelling is my iPad! Yes – we admit that we have one bag each of electronics! We have added a new service for DNS and VPN through UnBlock-Us to our travel arsenal. This allows us to have access to web services at home that are sometimes blocked if the web site is smart enough to check where we are logging in from. The UnBlock-Us service has been easy to set up and use even if you are not a travel planning geek. Navigating around and between towns is generally done with technology support. While we usually have a paper map from the hotel in our bag (marked up with concierge recommendations), my iPhone is always handy to help us to know where we are and where we are going. Paper is not enough for a real travel planning geek. CityMaps2Go is the map app of choice. It provides full offline, location aware maps. Points of interest can be “pinned” and the pins are available on all devices, allowing me to do planning on my iPad and then use the planned points on my iPhone. We have started to buy local data services when travelling which means I could be using Apple Maps but I have found that CityMaps2Go answers all of my navigating needs. I should note that we also travel with a GPS that has North America and European maps loaded. While we have been known to put it in walking mode and use it while exploring, this is generally used when we are renting a car. Power plug converters – we used to only pack these when traveling to Europe but we recently found we needed them on a cruise. All of our electronics can switch between 110 and 220 (or have a dual voltage converter) so we don’t need to pack a power converter just plug converters. A great sleep mask helps on the plane and when you have no blackout curtains. I recently bought an awesome sleep mask (the blue Bucky 40 Blinks” sleep mask). We can feel organized when we set off to travel but with the tools travelling with us, we can collect, update and change our travel plans as we go. That is the goal of being a great travel planning geek. The “plan” does not constrain us but enables us to spend less time surfing the net when we arrive and more time exploring the vast number of options already set out as starting points. How much advance planning do you do? What do you use to catalogue the planning materials? What are you using while you travel? 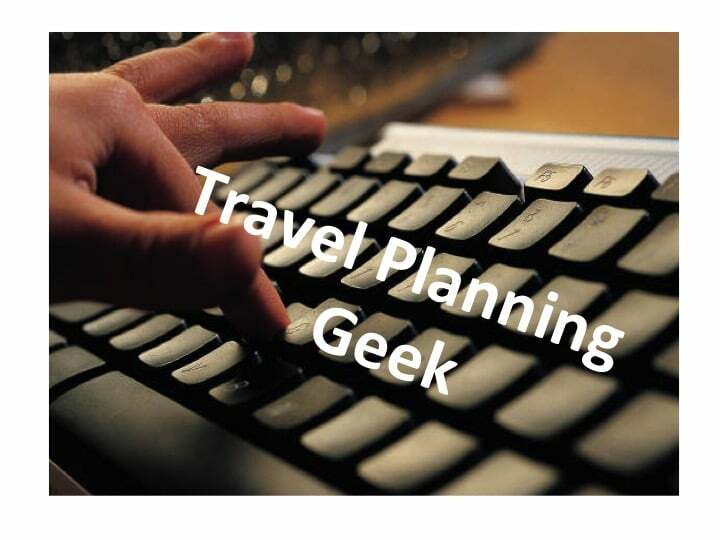 Are you a travel planning geek?